Congratulations, Elizabeth and Sandy! Both of you have just won a pair of tickets to this year's One of a Kind Spring Show taking place from Wednesday, March 25 to Sunday, March 29 at the Direct Energy Centre! Please email me at foodjunkiechronicles@gmail.com to claim your tickets. 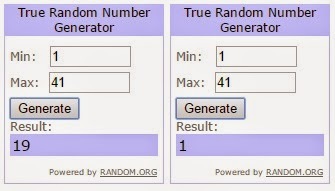 .I used "True Random Number Generator" from random.org to pick the two winners for me.